You were resident in Québec on December 31, 2013.
obtain a membership for an eligible child in a club, association or similar organization that offers physical activities or artistic or cultural activities, provided that the membership is for a minimum period of eight consecutive weeks in 2013 or in a subsequent year. Your family income does not exceed $130,000. You have a receipt that constitutes proof of payment of eligible expenses (registration or membership fees) for which you can claim the tax credit. You must keep your receipt in case we ask for it. Your family income is the amount on line 275 of your income tax return plus, if you had a spouse on December 31, 2013, the amount on line 275 of your spouse's return. If you or your spouse was not resident in Canada throughout the year, you must take into account in calculating your family income all the income you and your spouse earned, including any income earned while you or your spouse was not resident in Canada. The tax credit is equal to 20% of the eligible expenses (registration or membership fees). The maximum amount of such expenses is $100 per child, for a maximum tax credit of $20 per child. 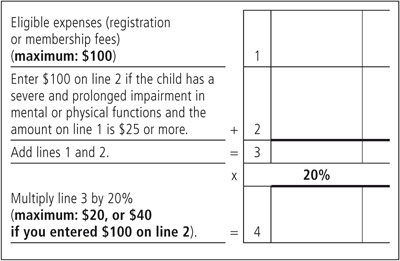 If the child has a severe and prolonged impairment in mental or physical functions and the eligible expenses are $25 or more, you can add $100 to the amount of the expenses. Note, however, that the total of the two amounts (that is, $100 plus the amount of the eligible expenses) cannot exceed $200 per child, for a maximum tax credit of $40 per child. Use the work chart below to calculate the amount of the tax credit to which you are entitled. Calculate a separate amount for each eligible child and then add the amounts for all the eligible children together. Carry the total to line 462 of your income tax return. If another person is also entitled to this tax credit for the same eligible child, the two of you can split the amount of the credit. While you can choose how to split the credit, the total amount claimed by both of you cannot exceed the amount to which you would have been entitled if only one of you were claiming the credit. fees that were used to calculate another deduction or refundable or non-refundable tax credit claimed by you, your spouse or another person. fees paid for an excellence in sport (Sport-Études) program.